I’ve been a bit busy recently and couldn’t follow my favorite ebook forum Mobileread.com as closely as I wanted. Also, it seems to have exploded with the release of Kindle 2. I don’t have the device myself and don’t plan to buy it, but I did notice a few things when skimming the forums. Apparently Amazon didn’t change the obfuscation for the firmware updates and an enterprising person patched my update maker for K2 to make an “update” which sets up a custom screensaver (apparently the K1 shortcut have been disabled). Apparently K2 includes a USBnet module which can be enabled with a debug command. This allows, for example, to use a PC internet connection instead of Whispernet, or to connect to services running on the Kindle. Telnet is possible, but it needs to be installed on the device first. Amazon released an iPhone application, and it is now possible use an iPhone or iPod touch instead of Kindle to buy and read ebooks from Amazon. Someone was quick to discover that a small change in kindlepid.py allows one to produce a PID for the iPhone and read library books (or remove DRM from purchased books) the same way as with Kindle. A few days later Amazon removed serial numbers from the “Manage my Kindle” page, probably to try closing this “hole”. It worked for about two hours. P.S. I did find some time to work on my scripts. 1) Updated kindlepid.py and kindledfix.py to support iPhone serials and fix the metadata corruption problem. Download. 2) Made a combined Kindle firmware update tool. It can extract a firmware update or make a new one, for Kindle 1 or Kindle 2 (K2 untested). Download. I already knew a bit about PRS-700 internals from the sources published by Sony, but looking inside allowed me to confirm guesses and find out some new things. So what's new in PRS-700? The main change is the CPU - Sony switched from iMXL to iMX31L. It is much faster (up to 532MHz instead of 200MHz) and has an ARM11 core (with ARMv6 instruction set) versus ARM9 in iMXL. It also includes USB2.0 OTG controller and SDHC/MS controllers, which allowed Sony to get rid of separate USB and flash card controller chips, though they did have to add an NXP ISP1504 USB tranciever. Another chip they dumped is the 2MB NOR flash which housed the bootloader and some other rarely updated info. Now everything is stored on the NAND flash, which doubled in size (512MB instead of 256MB). RAM size was also doubled to 128MB. The E-Ink controller is now Epson/E-Ink's "Broadsheet" S1D13521 (was E-Ink's Metronome), which has its own separate 8MB of RAM for extra display speed. Asahi Kasei DAC got replaced by Wolfson's WM8350 codec, which also includes power management, battery control and real-time clock. The sub-CPU which handles keys and touch screen is now a 16-bit Renesas R8C/2A, replacing the 8-bit H8/38004. On software side, Linux kernel was upgraded to 2.6.23 (compiled with gcc 4.2) from 2.4.17 (gcc 2.95.3), and glibc got replaced by uClibc. See my Flickr gallery for step-by-step PRS-700 disassembly guide. It was a bit trickier than PRS-505, so take care. When assembling, make sure there is nothing between E-Ink and touch screen, any foreign particles stand out really good when you turn on the built-in light. After I downloaded and extracted the root fs image, I quickly ran the /etc/shadow file though John the Ripper. In a moment it displayed the root password: "fiona" (which is the codename for the Kindle, by the way). Alas, it didn't work when I tried entering into console. Also, adding "init=/bin/sh" or "single" to the kernel boot arguments didn't work either. So I started to poke around with the firmware update and after some time was able to run a script which mounted the read-write part of root filesystem and dumped the /etc/shadow from it. Unsurprisingly, it had a different password hash. Apparently the root password is changed somewhere before shipping to the end user. So I quickly adapted the script to replace the shadow file on the device with the original one. You can find that implementation in this update maker zip. After replacing the shadow file and a reboot, I was able to get in. As you can see, /opt is writable and so is /etc which points to it. On factory reset, the writable partition is populated from /usr/default/opt.tar.gz file. Here's the full listing of the filesystem: list.zip. The main GUI and most of the back-end code is written in Java. The framework is quite elaborate and can be extended with extra "booklets". After spending some time investigating it with JAD, I found some undocumented shortcuts, features and easter eggs. Here's a more or less complete list. I'm not sure why Amazon didn't make it public (maybe because paging is kinda slow), but there is a basic picture viewer in Kindle. 1) make a folder called "pictures" in the root of Kindle drive or SD card. Kindle also checks for "dcim" made by cameras. 2) put your pictures for a single "book" into a folder inside that. The subfolder name will be used as the "book" name. Supported formats are jpg, png, gif. 3) in Home screen press Alt-Z. A new "book" should appear. Open it to view your pictures. 4) In the local menu you can toggle dithering, resize to fit and full screen mode. Various undocumented/underdocumented keyboard shortcuts. I italicized most interesting ones. It seems there is a location capability (GPS?) in the CDMA module. I cannot check it as I'm not in USA but the following shortcuts are programmed inside the browser. These command work in the search field. You can enter only beginning of the command if that's enough for it to be unique. Note: following commands are clearly not intended for end users. Some of them may damage your Kindle and void your warranty. Enter at your own risk. The Kindle uses Das U-Boot bootloader. To break into the interactive shell, just press any key right afer reset. The diagnostics U-Boot image is stored in the first partition. There are two kernels, standard and recovery with corresponding ramdisks. Recovery kernel is used for firmware update. There is a read-only root filesystem and read-write part. There is a partition with default content used for factory reset. Then there is a userstore partition, which is visible as mass storage drive over USB. There were no commands to copy data from flash to SD/MMC, but I could load flash partitions into memory and dump that. a2000070: 21 0a 40 e2 02 0c 40 e2 02 0a 40 e2 0c d0 40 e2    !.@...@...@...@. a2000080: 70 00 9f e5 70 10 9f e5 00 20 a0 e3 00 20 80 e5    p...p.... ... ..
a20000f0: 00 00 00 a2 20 00 00 a2 1c 56 06 a2 98 52 4a a3    .... ....V...RJ. Due to either my cable or inconsistent terminal settings, any dump of over 256 bytes was returning only some bytes in the beginning and some in the end. So I had to conjure up a little Python script to send dump commands in chunks of 256 bytes, parse the output and write it to a file. It took a few hours per partition, but in the end I was able to dump what I needed. In the initrd image of the recovery kernel I found scripts that performed firmware update and so I could reverse the update file format. Firmware update can be performed both over-the-air and from the SD card or mass storage partition. The firmware update file should match the mask "update*.bin" and reside in the root of the userstore partition (Kindle's USB drive) or SD/MMC card. There should be only one such file present. The file consists of a header and scrambled .tar.gz file with update files. Version value is made from the kindle version string. In my unit, it's 292-Kindle-012138 and the version value is 121380292 (12138*10000 + 292). The manual update doesn't check any fields except signature and md5. block_count is the number of 128K blocks to flash (see bbm show partition output above). If id is 129, the file is considered a shell script and is executed. If id is 128, the md5 is checked but nothing is done with the file. I made a small Python script to assemble an update file with all checksums calculated automagically. It will be included in the next post. 2 "Firmware Reset" clears all user-specific data and settings and returns the Kindle to factory state. I'm not sure if it will be usable without extra initialization by Amazon technicians. 3 "Exit" starts normal boot process. 0 (not shown) starts the diagnostics bootloader. Interaction is done mostly over the console, you won't see much on the Kindle screen. 1 "Firmware update" starts the manual update process. From reading the sources published by Amazon, it was clear that Kindle has a console running at least during boot. And there was an unconnected port available from outside. Logically, the console would be accessible there. I salvaged a flat cable with a connector from my Rio Karma dock and stripped extra conductors to bring the pin count down to 20. Next I needed a TTL-RS232 converter. I almost bought one from EBay, but then realized that I already have one in the form of a data cable for my Samsung GSM phone. 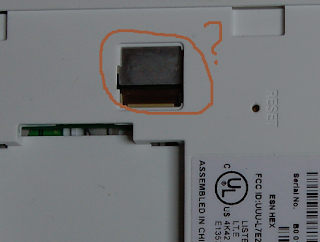 I stripped the phone connector, spent some time to discover the pinout of the cable, and was ready to search for the console. With a multimeter I found grounded pins of the debug connector so I knew which ones I can skip. 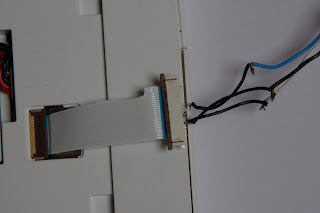 I then started PuTTY, set port parameters to 115200/8n1 (gleaned from source code), connected ground of the cable to the shield, and started connecting RX of the cable to every pin in order, resetting the Kindle each time. Eventually I was able to see the output of the bootloader. With a bit of solder I fixed it, and then did the same with the TX wire while pressing some keys on the keyboard. As I was at the login prompt at this point, once I had the correct pin I could see the echo in the terminal. Unsurprisingly, the RX pin was right next to the TX. I wasn't able to solder cable to the connector without shorting (the pins are 0.5mm apart! ), so in the end I removed most of the pins, soldered short wires to the removed pins and inserted those I needed back into the connector. There are probably JTAG pins too, but those are a bit harder to find by trial and error. Also, I don't have a JTAG cable. 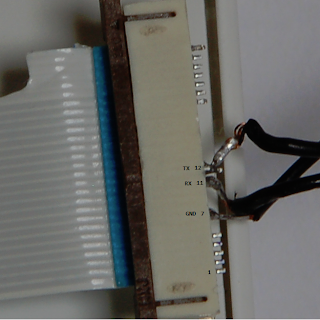 1) a 20-pin 0.5mm pitch flat flex cable with a connector. Digikey seems to have some. 2) a TTL-RS232 or TTL-USB converter. For the former, make sure you get one that can handle 3.3V levels (i.e. MAX232 analog won't do, you'll need MAX3232 or similar). For the latter, probably any will do. I liked looking into the Reader much more than the Kindle. I know that RapidRepair published their guide recently but I found it not detailed enough, so I tried to take many pictures when disassembling my own Kindle. I hope this will be interesting. Check photo notes for chip details. P.S. After I uploaded my photos, I found this post in PC-Doctor blog. He has some notes about the chips used.